Homeowners who are looking to upgrade their properties want to add value while improving the overall curb appeal of their home. A sturdy well built residential border fence can add privacy while beautifying the backdrop all in one simple step… Putting up a fence. If done incorrectly or without regard for the themed exterior of your home, a fence can actually detract from the curb appeal you have now. If you’ve ever been told you don’t know how to match your clothing, you might want to consider asking others for input when making the final decision of what kind of fence to go with. Besides just adding to your home’s curb appeal, a new residential fence serves many other valuable functions. 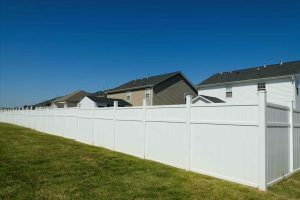 You can create privacy on your property boundary with a fence as well as protecting your pets and children from passerbys in the neighborhood. Fences can also designate certain areas of your yard for specific uses, like having a pool fence. In many states there are laws that require a pool to be fenced if it’s in ground. You have three predominant types of fencing materials for use with residential border fences. These are generally vinyl, wood, and aluminum. Although you do have a few other choices available, these are the most popular fence building materials. Of these, wood is usually the most cost-effective material and the cheapest to have installed. Many homeowners are drawn to the rich look of wood which can indeed make any home or property look better. Staining the wood can be easily done to match your home and add to the overall feel of your outdoor theme when properly maintained. 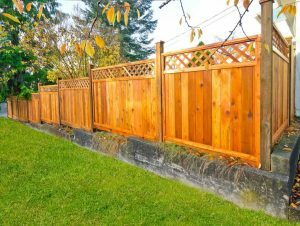 The sheer maintenance involved would make this type of fence a deal-breaker for many homeowners that have thousands of feet of fence to maintain, but homeowners with smaller yards usually find this to be a small price to pay for the eye catching charm of a wood fence. Perhaps a Vinyl Property Fence is the Right Choice? Some homeowners want a white picket fence around their property as part of the American dream they have envisioned for decades when they buy their first home. 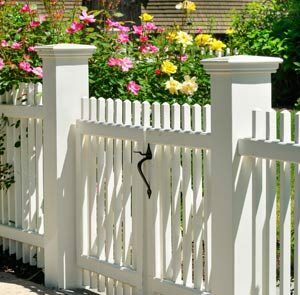 Picket fences are best used as a backdrop for flower gardens, vines, decorative bushes, or other landscaping at the border of your yard. A picket fence can be made from either wood or vinyl but the vinyl fencing is stronger though, more flexible, and usually comes with a lifetime warranty which makes it very appealing to homeowners. As if that’s not enough, the best part of all about vinyl is that you’ll never need to repaint it. It’ll look as good in 10 years as it does the day you put it up. In fact, some manufacturers claim their vinyl fence will be the last fence you’ll ever need to buy due to its strength and durability. Your color choices are bonded all the way through the vinyl material so even scrapes, scratches, and cuts that show the material under the surface are the same color all the way through. The initial cost of purchasing vinyl is higher than wood, but in terms of savings over a long period of time the vinyl will have greatly reduced maintenance and repair needs. We Are Here to Help With Your Fencing Questions! Whenever you are ready to erect a border fence at your home, consider calling one of our local Fence FAST company offices. They can answer all your questions and concerns while helping you make an educated decision on the right fence for your home. They can also give you physical samples of the materials to be used before any decision is made so you can see what you’ll be buying. We want our customers to be fully informed about all aspects of their new fence from Fence FAST. Even if you have started a fence project that you want to complete yourself, but need a little Assistance or proper advice, our local fence Company office will have somebody available to answer your questions or concerns. Customer satisfaction is always a primary concern for fence fast. To further complement your home’s curb appeal I would like you to also consider hand railing, porch / deck railing, stair railings, light / lamp posts and matching fence gates to further compliment your home. If you know what you’d like to do but do not know how to make it a reality, Fence FAST can help you make the perfect decision that will help you nicely build upon the attractiveness of your property.